Disclosure of non-financial information and social corporate responsibility information helps to measure, supervise and manage businesses performance and impact of their activity in society. 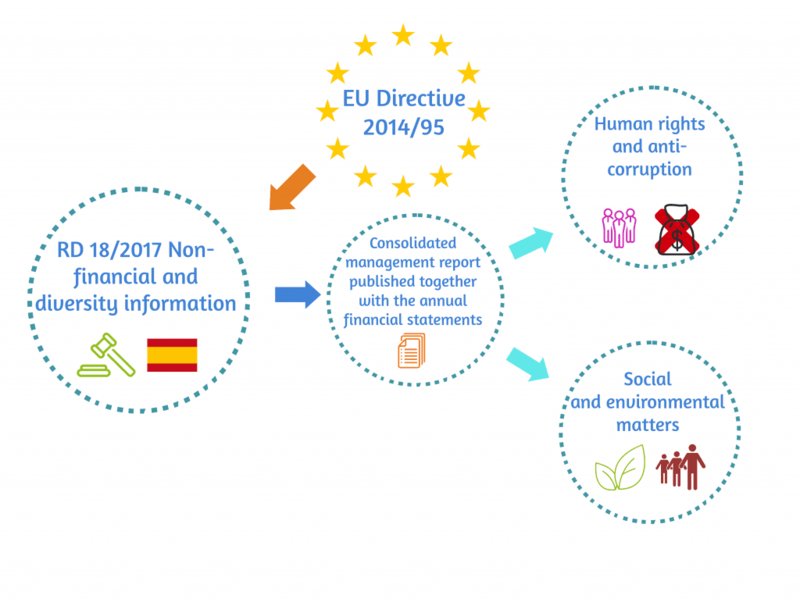 The Spanish Council of Ministers has given green light to the Royal Decree which transponed the European Directive on non-financial and diversity information. This new regulation force large businesses and business groups to include in the consolidated management report published together with the annual financial statements information related to social, environmental, diversity, human rights and anti-corruption and bribery matters. This new regulatory text is the Royal Decree 18/2017, Real Decreto-ley 18/2017, of 24 November, which modifies the Code of Trade, the restated text of the Law on Corporations approved by Royal Legislative Decree 1/2010, of 2 July, and the Law 22/2015, of 20 July, on Account Auditing related to non-financial and diversity information. Disclosure of non-financial information and social corporate responsibility information helps to measure, supervise and manage businesses performance and impact of their activity in society. In order to enhance the consistency and comparability of non-financial information disclosed, certain large undertakings should prepare a non-financial statement containing information relating to at least environmental matters, social and employee-related matters, respect for human rights, anti-corruption and bribery matters. Such statement should include a description of the policies, outcomes and risks related to those matters and should be included in the management report of the undertaking concerned. The non-financial statement should also include information on the due diligence processes implemented by the undertaking, also regarding, where relevant and proportionate, its supply and subcontracting chains, in order to identify, prevent and mitigate existing and potential adverse impacts. It should be possible for Member States to exempt undertakings which are subject to this Directive from the obligation to prepare a non-financial statement when a separate report corresponding to the same financial year and covering the same content is provided. As regards environmental matters, details of the current and foreseeable impacts of the undertaking’s operations on the environment, and, as appropriate, on health and safety, the use of renewable and/or non-renewable energy, greenhouse gas emissions, water use and air pollution. As regards social and employee-related matters, the information provided in the statement may concern the actions taken to ensure gender equality, implementation of fundamental conventions of the International Labour Organisation, working conditions, social dialogue, respect for the right of workers to be informed and consulted, respect for trade union rights, health and safety at work and the dialogue with local communities, and/or the actions taken to ensure the protection and the development of those communities. With regard to human rights, anti-corruption and bribery, the non-financial statement could include information on the prevention of human rights abuses and/or on instruments in place to fight corruption and bribery. As detailed in the new RD, such statement should include a description of the policies, outcomes and risks related to non-financial and diversity matters and key performance indicators. In addition, listed companies are obliged to include in their governance statement diversity policies and points of view taken into account when selecting their políticas de diversidad de competencias y puntos de vista aplicados en la elección de board of directors, in particular, related to age, gender, disability, training or professional experience.